Suvik being a manufacturing company since inception has recently invested in a big way in infrastructure building with a "Contract Manufacturing" in mind. Manufacturing being core competency of Suvik due to experienced craftsman with skilled engineering base and added infrastructure gives a sound reason to any parent company for cost effective manufacturing of their products in India. We have big storage space for raw materials, semi finished goods as well as stocking of finished goods before despatch. The new facility incorporates latest mechanism for the movement of finished goods shipment without any damage. Suvik has already established channels for logistics which help the distribution. With the increased utility power as well continuous availability due to location makes easy reducing the time to deliver. The quality assurance system operating as per certified ISO 9001 certification is well established to ensure that delivered product meets the customer satisfaction. There is a full proof quality control platform for incoming inspection, work in progress inspection as well as finished goods inspection. The state of art production facilities along with skilled and experienced manpower blend to deliver quality product in time. The recent augmentation in test facilities along with some kind of automation in testing has given a dividend in delivering fully tested equipments. 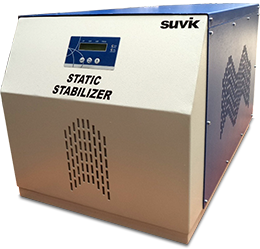 Suvik is continuously improving manufacturing facilities as and when required as per the contract. Suvik also guarantees against protection of intellectual property and trade secrets of Principle Company.